Welcome to Guns and Bugles. Updated 15 May 2002. My name is Don Neal and I'd like to introduce you to my book. My book contains a story you will not find in a single location, anywhere else. I'm told by those leaving their MESSAGES, that my book contains the 'human', rather than the 'sanitised' aspect of war. The book has had good reviews, including the one to be found HERE. As you'll see from the 'Photo Galleries' and the 'UNTOLD STORIES ' sections, this site and my book are about the personalities of those that were in the thick of it, more than anything else. I continue to hear from around the country from those whose Fathers/Grandfathers were in 181 Field Regt. These SUPERB PHOTOS were sent to me by Iris Hughes from Northants. Group – A super group photograph of the signallers of 177 Bty taken with their C/O Donald George Munro Peter Kirk is seated front row extreme left. Old comrades reminisce L/R Peter Kirk John Bramald, Walter Temple – Catterick 1994 – 50 years on. I would also like to thank Mark Smith, whose own Father Bill, fought alongside my Dad for his generosity he has been with me from the beginning doing a brilliant job building my web site and putting these stories up. 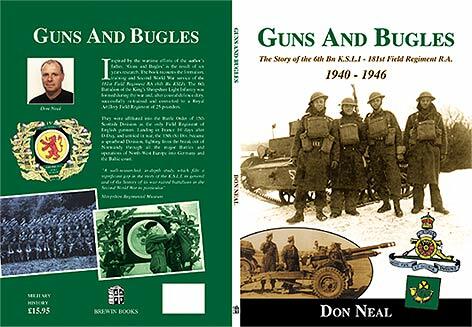 Those of you who have read "Guns and Bugles" will know of the tragedy that befell C Troop on 25 June 1944, when A Sub gun pit took a direct hit from a German shell. This left three men dead and three severely wounded. Recently I had a very interesting E-mail from Ron Curtis, his Father Frank was one of those who were severly wounded along with Gnr. John 'Ginger' May and Gnr Hawin. Amazingly Frank had never told him of this harrowing incident which hospitalized him for five months, and left him with shrapnel in his back. I think this indicates how much many of our old soldiers were traumatised by their war time experience. It was a very humbling experience, to be able to tell Ron the circumstances and events leading to this tragic start. Frank was posted to 181 Field Regiment from a home based Coastal Defence Regiment for service abroad, with Charlie Troop. He must have known my Dad as they both served on the same gun crew for some time. Many thanks to Ron for adding another piece of the jig saw. My archive of photographs and stories continues to grow. To see the latest, click the image below. Find an old colleague, or a story containing a remembered name. Search on ALL words or ANY words. ANY words will find all documents containing either of the words entered. ALL words will find only those with ALL words. You can use capitals or lower case letters. 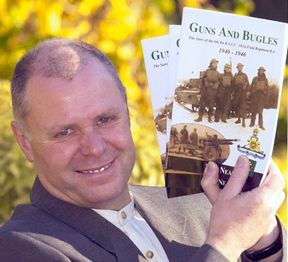 Published in November 2001, the book is based on the exploits and War service of my father's Regiment. It is the result of six years of research and includes both interviews with the men who were there and letters from other members, which have arrived from all parts of the UK, as well as a gallery of over 120 photos. These are only part of the complete collection, more of which I shall put on the photo gallery pages. I'm pleased to say the book has received an endorsement from the Regimental Museum in Shrewsbury. The formation of the 6th Bn King's Shropshire Light Infantry in June 1940 and its training and coastal defense duties on the North East coast. The conversion of the Battalion on 01/03/42 to the 181st Field Regiment RA. and its Artillery training in the Melton Mowbray area of Leicester and the Yorkshire Moors. The Regiment at war in North-West Europe, to its disbandment in January 1946. When the 6th Bn. K.S.L.I. was formed just after the Dunkirk evacuation, it consisted of mainly conscripted men who were trained, in Sherwood Forest, by a core of regular and ex-Regular Officers and NCO's. They were posted to the Lincolnshire coast where they guarded a 27 mile stretch of coast as part of 204 (Home) Brigade. Here they waited for the German invasion which was expected at any time in the weeks following the Dunkirk evacuation. After 18 uneventful months and with the threat of a German invasion almost gone, many Infantry Battalions were converted to Artillery Regiments - this was the destiny of 6 K.S.L.I. 484 NCO's and O/R's plus 18 Officers of the Battalion, were transferred to the Royal Artillery. After arriving in Melton Mowbray for their initial training the Regiment was brought up to strength by an influx of Artillery Personnel, many of whom wore, with pride, the riband of the North Africa Campaign. After about 3 months they were posted to the Yorkshire Moors, to continue their training - here they came into the battle order of the 15th Scottish Division, one of only two units of Sassenachs, the other being the 1st Bn Middlesex Regiments (the "Die Hards"), which was the Machine Gun Regiment. Intensive training with the Jocks in the following 18th months brought the two nations together under the sign of the Rampant Lion. By the end of the War, the Gunners referred to "Our Infantry" and the Infantry referred to "Our gunners" when talking of their exploits. The book tells the story as remembered by those that were actually there. It tells of the horrors they faced and the strong sense of comradeship it engendered. I feel honoured to have been able to speak personally to men who were the real heroes of the war, those on the front line, to fill the pages of my book. One thing I was really hoping for when I had my book published was that I might hear from ex-members of the Regiment or maybe their relatives. Imagine how pleased I was when I had a call from Ian Prutton, particularly so because my knowledge of F Troop was scant indeed. Ian's Father was Capt NW Prutton MC and he was F Troop leader, 179 bty. You can read all about Capt Prutton on page 76 of the book. I now have marvellous portrait photo of Capt Prutton, which I have put on the site and also a photo of F Troop which I shall endeavour to get named. These are in Photo Gallery 5. I now have a photograph of all the Troops, with exception of 'A' and 'E' Troops. I was saddened to hear that Nigel died when he was only 55 years old. Among the photographs Ian sent was one of his Father's wedding day. The best man? None other than Major Dudley Shaw. My thanks to Ian and his wife Dianne for all their help and interest. TRAGEDY AT THE GHEEL BRIDGEHEAD. One of the few glimpses I had of my Dad's war experiences from his own lips was the tragedy that befell Charlie Troop at the Gheel Bridgehead. As children we had a close neighbour who too had fought in the war. His name was Vernon Thomas, when my interest in military Research developed in later life I interviewed him at length on his war service. 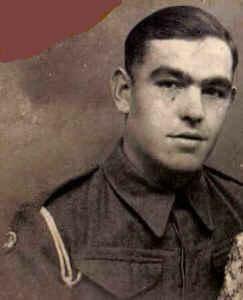 He served in the Guards Armoured Division, 1st Battalion Welsh Guards. He was a sniper and his war was "very personal" as he told me. Amazingly, he and dad fought in the same arena on many occasions. Read MORE about the tragedy here. Click the image on the right to see a larger picture.